Product code: Anchovy Stuffed Category: House Brand. A long brining process results in a RIDICULOUS Olive! These large beauties are stuffed with CA Garlic & Jalapeno. Far and away our best in-store seller and a key component in all those wonderful Havasu Bloody Marys. May contain pit fragments. BALLS OF FIRE! Papa Stapes says these have an “in and on the way out burn”…we let you figure that out. Not for the faint of heart! May contain pit fragments. Of course we have plain pimento stuffed, even a spicy pimento but this is The Boss. Large CA green olives hand stuffed with Pimento and the added kick of a “skosh” of Vermouth in the brine for the ultimate Dry Martini. May contain pit fragments. Graced with a stuffing of California Jalapenos that have been seeded and most of the membrane removed. Yes, heat is a subjective thing but flavor is not. Folks, these are flavor-full! May contain pit fragments. For the ultimate twist in your cocktail and just great eating. 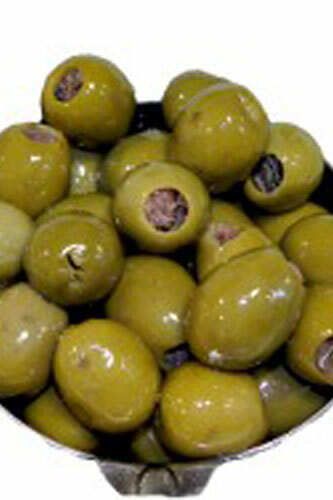 Large CA green olives hand-stuffed. Specify if you want Bleu Cheese, Feta Cheese or Pepper Jack Cheese Stuffed. May contain pit fragments. Very popular seller in the shop. Large California grown and processed with no lye. Excellent crunch and mild flavor. May contain pit fragments. Large California grown green olives hand-stuffed with that famous CA Garlic, Baby! Seasoned just right to add a special light kick. A Papa Stapes special favorite. May contain pit fragments.